Love That Max : Kids with special needs: It's not me, Mom, it's YOU! Kids with special needs: It's not me, Mom, it's YOU! The other morning, Max and I were lazing out in bed, neither one of us wanting to start the day. He pointed to something out the window and said a word. I had no idea what he was saying. It sounded like "air-ay." "What did you say, Max?" I asked. Max said the word again. I took a guess: "Are you talking about Caleb?" I asked (his bff). He pronounces Caleb in all sorts of ways; the "c" and the "b" are difficult for him to say. "Noooooo," said Max, and said the word again. "Sweetie, I'm not understanding you," I said. Max leaned over close to my face, looked into my eyes and said, "AIR-AY." I still wasn't getting it. This time, he leaned over to my ear and practically shouted "AIR-AY! AIRRRR-AYYYYY!" Max didn't think I wasn't getting what he was saying; he thought I was having trouble hearing him. It took me a few more tries to figure out the word was "airplane" and that he was telling me that he'd like to take a plane trip somewhere, and could I please make that happen? "Yes, Max, we'll go on a plane trip this year," I said. "Yes, we'll eat spaghetti on the plane," I promised. He's not the one with problems. He's not the one with the challenges. Au contraire: It's me and anyone else "typical" who has trouble understanding him. My mom probably wishes she had your problem she can't get me to stop talking LOL anyway I just wanted to make a suggestion although I think your already doing it on the ipad when you can't understand him get him to write or type what he has to say I can't imagine how frustrated he gets wheen people don't understand what he's trying to say. 12 is very much like that. It's not that she can't tel me what she wants, it is that I don't understand her. Just curious--how do you know that Max wasn't saying "I hear an airplane flying overhead" (a sound you, with your jaded adult ears, may not have noticed) rather than "I want to take a plane trip"? It must be frustrating (to both of you) if it's hard to tell a comment from a request! That reminds of my youngest half-brother. Among other things he has mild cp. His speech was all vowels for a long time. 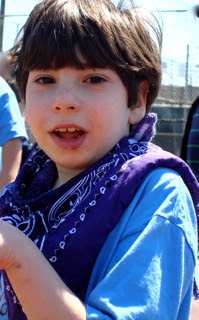 The school tried to get him to do sign language and picture exchange but he felt like people should just understand him. Nisha, Max is beginning to spell out words on the iPad, but not there yet. I hope so, soon! Anonym Ous: I knew what Max was asking because he often does talk about taking plane trips, although he's pronounced "airplane" in different ways. Also, when I finally did say, "OHHH! You want to go on an airplane," he nodded vigorously. I've written before that, yes, sometimes it is frustrating to know what he's saying. The iPad helps, although it is not surgically attached to his body. Love this post. Interesting that you posted it this week when I just wrote a blog post on a similar topic. Recent research indicates that a viable therapeutic approach is to change the task and/or environment rather than trying to change the child. Which many therapists do daily but this would be your primary means of achieving functional goals. You can read more at YourTherapySource.blogspot.com if interested. t's OK, Max...she's still learning! That's what my son Tevis would probably say. If I don't understand something he's said, he'll ask, "Haven't you ever heard of that?" If I finally figure it out, he'll ask, "How did you know what I was saying?" I'm thinking "because I'm a mind reader," but I say "because you explained it so well." "Hearing impaired" is one of those words we're trying to get rid of. Preferred terminology is hard of hearing or deaf. we hope to get an ipad soon and want to use it as a supplement to language development and signing. Like you, we understand our own child much better than other folk and know that communication has to be about talking to them intelligibly, not just us. Anon, thanks for letting me know. I wasn't aware of that. Galen, Tevis sounds like one cool kid. DDerby—I am going to give away an iPad here soon!